Home Home Decor	Butler’s Pantry Remodel Project! Happy Monday, Friends! Well, it’s official. Tomorrow begins the long-awaited butler’s pantry remodel project! Come see what it looks like now and our plans for the room once it is complete! Which may take a while…. When I say “long-awaited” butler’s pantry remodel, I mean four months. We moved in June 1 to be exact. So, technically it has not been that long. If you follow along my meandering blog, you know our new house has a charming French Country vibe which we love. But along with that comes a few quirky things we are not accustomed to. Such as, there is no refrigerator in the kitchen. Nor are there any upper cabinets. You can see from the picture below- the back wall of the kitchen. It is mainly comprised of a large hood and fan. At first we thought this was going to require a major remodeling project simply because it is so unusual. The refrigerator and cabinets are located in an adjoining room the previous owners called a summer kitchen. I think that is probably the proper European term for Butler’s Pantry. And since I’ve always dreamed of a having a butler’s pantry, that’s what we are calling it. After living in the house for a few months, we’ve grown accustomed to walking into another room for our refrigerated items and canned goods. And we figure we can use the exercise! So here is how the pantry currently looks. When you walk into the room you are faced with a long bank of dark cherry cabinets. There is a warming drawer in the center of the bottom cabinets and pretty tiles on the walls. Did I mention the room also serves as a laundry room? Lacey eats in here too. We have a truly multi-purpose space. So, even though the room is quite large, there is no counter space. Thus, when we bring in groceries, we sit them on the floor and unload the bags. The cabinets in this room are custom-made by Eudy and are very high-end. So replacing the cabinets doesn’t make sense. And they are beautiful. The cabinets have no built-in bottom shelf and therefore sit directly on top of the granite, which goes all the way to the back wall. As a result, there is very little counter space when the cabinet doors are closed. About 6-8″ at best. Yet, there is a solid 2 feet of space between the top of the cabinets and the ceiling. My husband and I feel like this is wasted space. We decided the solution to all of our problems is to move the existing cabinets all the way to the ceiling. By doing so, it will give us a new work and prep surface of 25″ from the back of the wall to the front of the countertops. The cabinets will be moved up 24″ to fit flush with the ceiling. The crown molding will need to be made over, but that’s ok. The new configuration will yield tons of space! The laundry area is going to get a little overhaul as well. The upper cabinets will also be moved to the ceiling and another shelf built below to hold everyday items such as laundry detergent, baskets, etc. (In a neat way I hope.) Our front load washer and dryer are housed in a built-in box that is also about 10-12″ away from the back wall. The surface makes for a great folding station, but its depth makes it difficult to reach the shelves and takes up valuable real estate in this room. The contractor will cut down the “box” and slide the washer and dryer back closer to the wall for better efficiency. To the left of the washer and dryer is a utility sink and more storage. This area will remain the same for the most part, although I think down the line the wall to the left would be a great place for a plate rack to store some of my prettier platters and silver trays. Currently the cabinets in the main pantry and over the laundry area are two different wood finishes as you can see. We’d like them all to match for a more cohesive look and feel. Once the cabinets are raised to the ceiling and the crown molding put back into place, we plan to paint all of the cabinets a creamy white with a bit of antique glaze to soften them up. I plan to replace them with two of my favorite chandeliers. We used these for my son’s engagement party and my niece’s wedding. Now the festivities are over, it’s time for them to take center stage in our new Butler’s Pantry! See the two chandeliers hanging on each side of the boat house at my niece’s wedding? Yes, those are the ones! 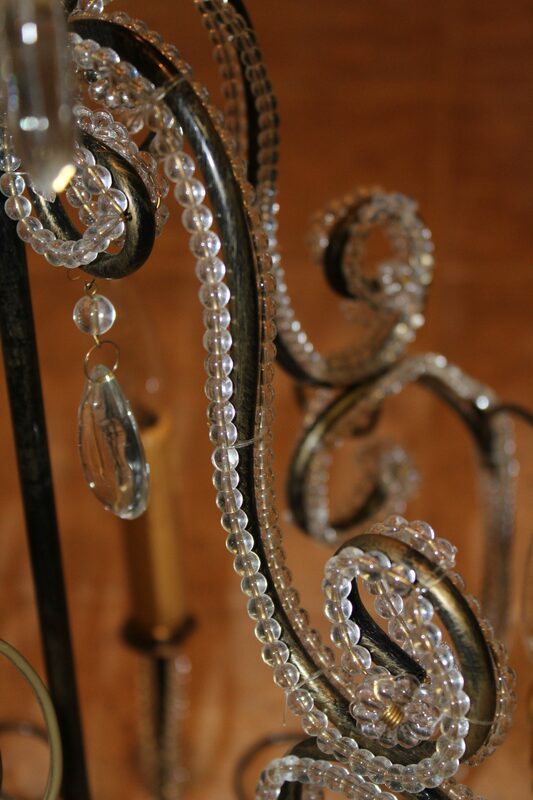 And you know how much I adore crystal chandeliers. The chandeliers are currently on a plug but I figure I can use the plugs later and these will be hard-wired by our electrician. I’m sure he can’t wait. Also, there are four lights per fixture which will give us lots of great task lighting whether we are preparing food or folding clothes. Aren’t the details pretty? I digress. The ultimate goal of this room is to serve as an efficient storage place for our food and entertaining accoutrements. Also, we’d like for it to function as a serving station when we entertain and have dinner parties. Because all of the food items are already in this room, it makes sense for it to function as a prep and cooking area. So, today I am cleaning out every single cabinet and drawer in this room and staging it in the garage until the room is complete. The contractor is coming first thing in the morning to begin. I have no idea how long this will take but we are anxious to get started. My husband is very handy and would normally do this job himself. But, he knew this project is big and it will require more than one set of skilled hands. It also requires the proper tools to complete the job and make it look like we envision. Sometimes, it’s just makes sense to hire a professional! Isn’t it fun to put your own spin on a new house? As charming and beautiful as this house already is we feel like it needs a few tweaks to make it fit our family and lifestyle. And it won’t cost an arm and a leg either! We’ll keep you posted on the progress. I think the finished Butler’s Pantry will be something we will enjoy for years to come. And in the event we ever sell this house, it will hopefully be a unique selling feature! What a Difference a Chandelier Makes! It looks like you have come a long way with your house since you moved in. We will be joining you soon on that journey for we have also decided to move…in the attempt to downsize. We have accumulated a lot of stuff in the 7 years that we have lived in our current house. We are building a new house and hopefully will move in by late spring. I never thought we would go on this adventure again….but here it goes. I am moving a lot slower than the last time we moved. I will keep you posted and will be interested in seeing your progress as well. Wow, Susanne! That’s a huge step! I can certainly relate to downsizing. We got rid of SO much stuff and still have an attic and storage room full! One of our sons is moving to a larger apartment soon so we are hoping to pawn some more things off on him. Good luck with your new home! (and I can relate also to moving slower this time around!) 😉 Please keep me posted!